It’s not losing weight that motivated me to try this way of eating, but the incredibly frequent bouts of fatigue resulting from my hypothyroidism. If you too are under the spell of your under active thyroid, you may have realised that Levothyroxin does a good job at getting you excellent TSH, T3 & T4 blood reports, but is useless for countering the symptoms. There could be 300+ symptoms of treated *and* untreated hypothyroidism. I mean you can pretty much blame the disease for the crazy amount of hair you lose to your brush or not wanting to get up from the couch from exhaustion, even if you haven’t lifted a finger all day. From wondering how you gained weight rapidly without binge eating, to outright depression. There are several important aspects of your life that need taking care of, such as making sure you get enough sleep (people with hypothyroidism need an hour extra! ), avoiding raw food (cook those healthy veggies), avoiding soy, and taking many breaks while doing a physically demanding task, instead of doing it all at once, non-stop. It began when I came across an article which listed out the pure evil that lurks behind any food that contains “added sugars”. Consuming sugar can give you an instant boost of energy and a subsequent lullness. For me, the lull was extravagant! 10 on the scale of 10! My mind would be buzzing with ideas and activities “let me go there and do this, perhaps try that and figure this…” which would eventually boil down to…"naah, screw it, some other day” Which was BAD, *very* bad! Not to mention the weight I was rapidly gaining and the hair I was rapidly losing. 1 Not eating *anything* with added sugar in it. 2 Reading the labels and ingredients carefully and saying no to any “alternative” name of sugar, such as corn syrup, glucose, sucrose, malt syrup (Google it! There are 50+ “alternative” sugar names!). If something isn’t sweet, doesn’t necessarily mean it doesn’t contain sugar. for e.g. ketchup contains corn syrup. 3 Avoiding anything that is labeled as “sugar-free”. Because that means it definitely has “fake” sugar, which is more harmful than actual sugar. Quitting Sugar, i.e. 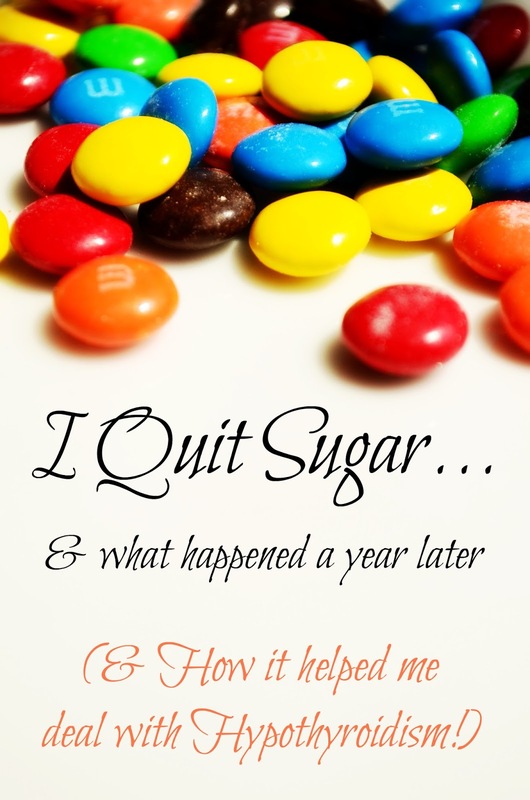 quitting just the ONE thing is that way quite straight forward, as you don’t have to think too much about everything you eat, just say no to anything with sugar! And eat everything else! Cuz you then automatically avoid: ice creams, cakes, doughnuts, chocolates, biscuits, juices, soft drinks, sweets, pancakes, brownies, pastries, etc. There are a dozen diets out there. Gluten free, vegetarian, vegan, high protein, raw food etc. But I believe your body is unique. The world population is over 7 billion humans, NOT robots. Every one has a unique mind *and* body and it is all up to YOU to figure what works for YOU. Cutting out sugar worked for me, cuz shortly after doing so my frequent bouts of fatigue disappeared drastically. I was up and about *and* I lost 10 kilos slowly over a period of one year, i.e. I was back to my pre-hypothyroidism weight. I cannot imagine some one with a sweet tooth giving up the love of their life, not only is it hard, but there is a 100% guarantee to binge eat with a tub full of something-something just days after no sugar. This inevitable circle is dangerous, and to them I’d recommend reducing sugar, rather than completely avoiding it. I thankfully prefer savoury to sweet (which I realised only after I quit sugar!). What’s important to note, is that once you fall off the sugar wagon, your body re-adjusts it's taste buds. There was a time not too long ago when I would have a tub of ice-cream in one sitting without batting an eye lid and now I simply *cannot* have a full piece of cake without cringing and wanting to throw up! I have sat on a table full of sugary treats with every one feasting while I was perfectly happy with my sugarless coffee. And had 40 kids surrounding my kid’s birthday cake yet having no desire to taste it. The challenge is when invited to some one’s place. I don’t usually meet people who are offended by “I don’t eat sweets”, but there are exceptions! They think that I’m missing out the most fantastic thing ever cooked on the face of the earth and nag the hell out of me saying: “try this! It's absolutely the best! one sweet won’t hurt!”. I have to grin and bear it or simply accept a bite and slip it innocuously to my sweet-loving-thin-as-a-pin husband. Another challenge is getting through hunger pangs when late for dinner, when away from home. It is *very* difficult to find something without sugar in the sea of doughnuts. I somehow enter coffee shops that have run out of sandwiches and *not* sugary treats, go figure! The way to counter the situation is to carry snacks. I anyways carry it for my 3 year old and the same snacks work for me as well; a small 200 ml pack of milk or a banana; dry fruits or a few grapes. Anything to temporarily pacify your tummy as dinner time slowly approaches. Life doesn’t have to be that hard! So when there is an exception, its is an ice cream on my birthday, plum cake on christmas or shrikhand for a festival back home. I reserve the exceptions for things I *really really* like. They should be every bit worth the exception. Although I admit I’m not too kicked about it. I’ve had Ice-cream & a Chilean Dulce since we moved to Santiago, and each time I ended up tired the next day. I’d rather be up & about than be tired for 7 hours together for 7 minutes of pleasure! Also, alcohol is never barred from any diet I’ve ever followed. Usually it is wine, but if it’s anything else, I *never* add any mixer. In the end it is your whole attitude towards life. It’s not just sugar, but I avoid starchy food & deep fried food too. I’m *very* uncomfortable stepping inside a McDonalds or having Chorizos. And I make sure plenty of fruits, vegetables and nuts are a part of our daily diet. The doughnut is NOT worth it at all if it’s at the expense of your zest for life! Labels: I Quit Sugar, Surviving Motherhood- unscathed! Congrats on your healthier lifestyle. It would be hard to cut it out 100% for me. But, cutting back is definitely something we need to do in our home. Thanks for sharing at the Inspiration Spotlight party. Have a great weekend. Congrats - one year is amazing with all the temptations. Not sure I could do it. Trying to cut back after I started reading labels with my little one so it's helped a little. I didn't realize honey would be on the list too. Thanks for sharing your story and keep up the great work! Good job! We quit sugar & wheat. Like you said just because it isn't sweet... the same goes for wheat. They put it in all sorts of things (soy sauce, dressings, etc.) We do use honey, but local and sparingly. It's not easy. And it might sound petty or some other better word, but I'm proud of you. There are a ton of people who are actually diabetics that don't care. I can't imagine that. I would find quitting wheat more difficult! That's quite a commitment. I just finished a "sugar intolerance test" with no sugar, no carb, no processed food of any kind for two weeks and one of the hardest parts was how many things contain small amounts of sugar or sugar substitutes. Very eye opening. As it turns out, my body doesn't have as big reaction to sugar as I thought it would (I was predicting big energy level changes but it didn't happen) but going cold turkey for a couple weeks has made it easier to modify my every-day eating habits to contain less sugar overall. I don't think I'd be able to remember all the names of the "fake" sugar - 50?! Wow! I'm glad you found something that helped you feel better! Thanks for sharing at the Thoughtful Spot! Well neither do I ! But I kinna know how those names usually sound like.. and esp when something sounds like a "chemical" I avoid! So just out of curiosity, what did you eat on a typical day? I ask because I had a friend go on a diet like this (and yes, she bemoaned that she couldn't even eat KETCHUP!) for about 6 months because of a health issue and she was miserable. Of course she couldn't have other things like starches or dairy because of the particulars of her issue. Well I eat everything except things with added sugars! I eat meats (beef, goat meat, chicken and fish mostly), fruits, veggies, nuts, & carbs such as wheat, rice & oats. I eat a lot of dairy too! Milk, yogurt & cheese especially. So I never really have to complain about food! Good Job! 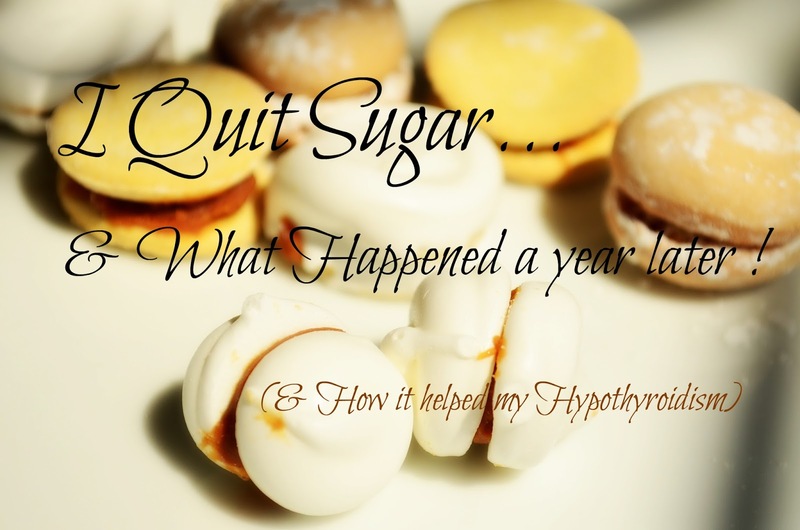 I have tried and failed to completely quit sugar but I sure have managed to eat less. It's a hard thing to do. haha..yes it is, but don't stop trying ! I've quit before and it felt great! Right now I'm sugar binging (shame on me!!). Thank you for the motivation to try again. It's funny reading this right now, my chiropractor just put me on a two week sugar elimination diet to get my digestive and immune systems back on track. I'm glad to hear that it's been really good for you. Just curious,what kind of wheat products do you eat? Usually bread has some kind of sweetener (I didn't know honey was a problem!) so I was wondering what you use? On weekends though we avoid carbs after breakfast so have steaks (salmon/ sirloin/ chicken breast) and stir fry veggies only. Which actually feels great and not too stuffed as bread/rice/pasta makes you feel. You are a strong strong woman! I was diagnosed with pre-diabetes so I cut out soda and honestly, I feel great! I know how you feel! It wasn't that hard after all! I used to *love* my coke! when I was told it contains at least 9 tea spoons of sugar I couldn't believe it...like c'mon it's not *that* sweet! Hey, it's amazing, Really useful information. Great work.